New Jersey Gov. Chris Christie declared he was running for the Republican presidential nomination Tuesday, hoping his reputation as a tough, straight-talking governor can win over centrist primary voters in a crowded GOP field. He will be a force. 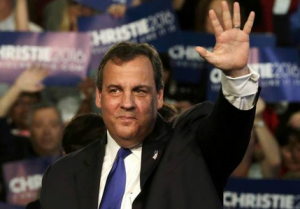 This election needs Chris Christie’s style. He is outspoken, clear and takes no BS from anyone, media, politicians or the public. As a two term Governor he has experience and as he stated, he is the Governor of a blue, Northeasern state with a Democrat legislature. But he will get pressure from the left on ‘Bridgegate’ (which he needs to have an answer for, not because it matters, just to get the question off the table), the budget and financial status in NJ over his term and particularly now, and those who don’t like him in NJ (particularly in education) will be orchestrated by the Democrats to come out of the woodwork to denounce him. Nonetheless, his Republican competitors for the nomination will have to deal with him as a serious contender.